All six user roles have the ability to enter new incidents, although the form they fill out will vary from role to role. Administrators and Supervisors complete the same form. Their form has access to all sections of the incident, allowing them to enter all details from target start date to transactions. 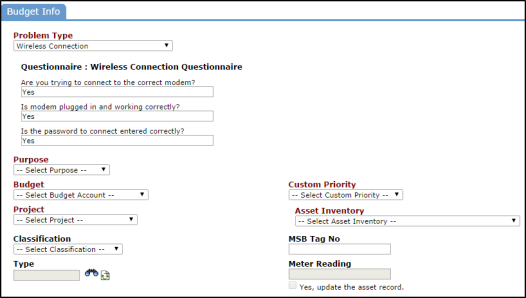 *Fields that are marked with a red checkmark are required fields. Checking the Emergency? check box, will make this incident appear in the Work Center section of the homepage as an emergency incident. As an Administrator or Supervisor, you can either directly assign an incident to yourself or to another user in the Assigned To drop down box or you can assign it to a Work Queue. 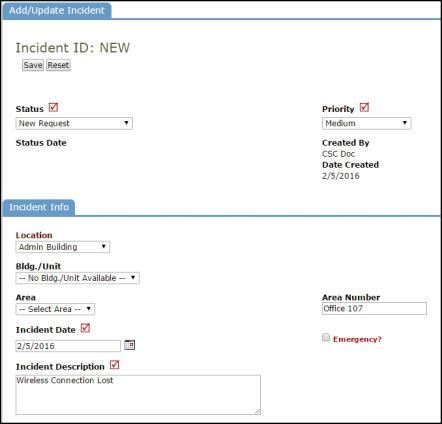 This section allows you to set alerts when the status of the incident has not been changed by a specific date or time.